History suggests that DRAM ASP and market growth will soon trend downward; suppliers cautious and stand ready to adjust capex expansion plans. In its September Update to The 2018 McClean Report, IC Insights discloses that over the past two years, DRAM manufacturers have been operating their memory fabs at nearly full capacity, which has resulted in steadily increasing DRAM prices and sizable profits for suppliers along the way. Figure 1 shows that the DRAM average selling price (ASP) reached $6.79 in August 2018, a 165% increase from two years earlier in August of 2016. 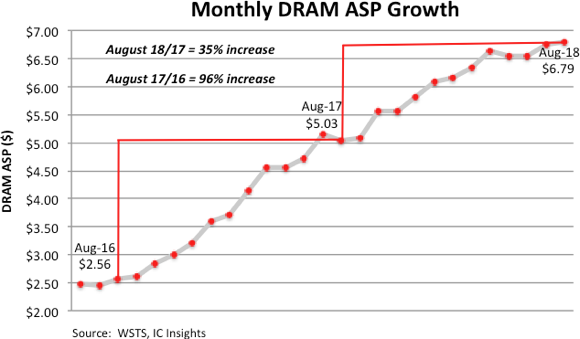 Although the DRAM ASP growth rate has slowed this year compared to last, it has remained on a solid upward trajectory through the first eight months of 2018. The DRAM market is known for being very cyclical and after experiencing strong gains for two years, historical precedence now strongly suggests that the DRAM ASP (and market) will soon begin trending downward. One indicator suggesting that the DRAM ASP is on the verge of decline is back-to-back years of huge increases in DRAM capital spending to expand or add new fab capacity (Figure 2). 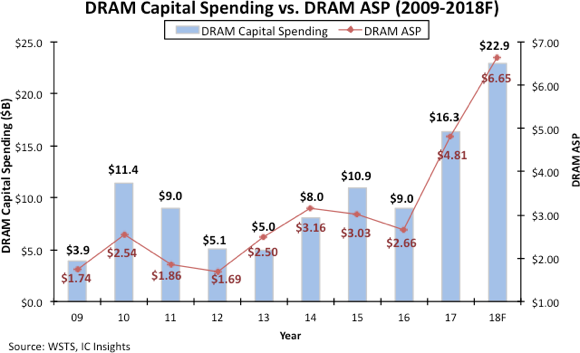 DRAM capital spending jumped 81% to $16.3 billion in 2017 and is expected to climb another 40% to $22.9 billion this year. Capex spending at these levels would normally lead to an overwhelming flood of new capacity and a subsequent rapid decline in prices. However, what is slightly different this time around is that big productivity gains normally associated with significant spending upgrades are much less at the sub-20nm process node now being used by the top DRAM suppliers as compared to the gains seen in previous generations. At its Analyst Day event held earlier this year, Micron presented figures showing that manufacturing DRAM at the sub-20nm node required a 35% increase in the number of mask levels, a 110% increase in the number of non-lithography steps per critical mask level, and 80% more cleanroom space per wafer out since more equipment—each piece with a larger footprint than its previous generation—is required to fabricate â‰¤20nm devices. Bit volume increases that previously averaged around 50% following the transition to a smaller technology node, are a fraction of that amount at the â‰¤20nm node. The net result is suppliers must invest much more money for a smaller increase in bit volume output. So, the recent uptick in capital spending, while extraordinary, may not result in a similar amount of excess capacity, as has been the case in the past. Of course, a wildcard in the DRAM market is the role and impact that the startup Chinese companies will have over the next few years. It is estimated that China accounts for approximately 40% of the DRAM market and approximately 35% of the flash memory market. At least two Chinese IC suppliers, Innotron and JHICC, are set to participate in this year’s DRAM market. Although China’s capacity and manufacturing processes will not initially rival those from Samsung, SK Hynix, or Micron, it will be interesting to see how well the country’s startup companies perform and whether they will exist to serve China’s national interests only or if they will expand to serve global needs. This could easily expand the trade war if Chinese SOE's are subsidized to grab market share and that is the big question. Another question is whether they use home grown technology or borrowed technology. Any thoughts or comments on this appreciated. It will take a while for the SOEs to add up to enough to matter. They are not investing in the kind of equipment Micron listed, so they will be at lower quality points in the market. Also, DRAM world capacity is huge. Adding a couple of plants is just slightly increasing the population. The supply demand balance in DRAM has been remarkably vicious. It is pretty hard to tell what price sensitivity there is. This might be since the product cycles are so long. Products are just now coming out of a couple of years of belt tightening, rethinking how to do more with less DRAM. Even if prices fall a bit the product momentum keeps going in that direction. Meanwhile the vendors are flush with money and know that while they eke out meager margins at the bottom of the cycle they got lavish rewards at the top and they each want to be the biggest. So they will still build capacity. Then the new flashy products that do use DRAM because it seems cheap will finally show up a couple of years from now and BANG, sellers' market again. It just seems like the time constants are too long to get stability. Any EEs or mathematicians out there will remember how just having feedback (market forces) does not guaranty a well functioning circuit. If your gain-phase diagram in polar coordinates encloses -1 then you are in for a wild ride. Yes but, it could be different this time. With Intel losing power and workloads moving to AI the DRAM market is moving from one sea of x86-attached chips to as many specialized and high performance variants as there will be AI inference engines. That is to say life applied a giant hammer to the unified world if x86, splintered it into a zillion little pieces, each of which will demand very high performance memory. The Chinese may be building for the Moore's Law market but it has moved to the post Moore's Law AI market that looks very different. This is the market MU focuses on.